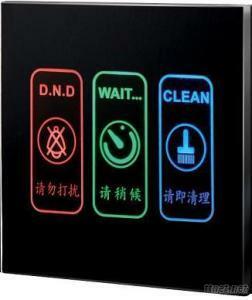 Press the "do not disturb" switch, touch screen "do not disturb" design backlighting be lighted, hints at please do not bother, touch the doorbell doesn't work, in the room the doorbell not ring. Press "please namely cleaning" switch, touch screen "please namely cleaning" design backlighting be lighted, tip room to clean up, let the waiters very clearly know room to clean up the requests. Press "please later" switch, touch screen "please later" design backlighting be lighted, tip visiting guests later.